Ahoy to all the Music Lab fans! Our open cultural space is supporting young artist and culture life in Brno from the very beginning. This time it’s us, who need your help. As you probably know, starting from 31.5.2017 the “anti-smokers law” came into force in Czech Republic and banished all the smokers out to the streets, no matter if the bar had a good smoking room, just as we had at Music Lab (R.I.P.). This change brought us many issues, the biggest one being the noise outside of Music Lab after 10pm. Smoking groups are usually formed in front of the Music Lab in the evening, talking about various themes. Although it’s just a spoken word, which doesn’t exceed the silent hours noise limit, it disturbs the people living at the Opletalova street. You can say: “So what, it´s everywhere like this nowadays”, or “so build a shelter in front of Music Lab and problem solved”. Unfortunately, it´s not that easy. We ended up in the gap in law, where nobody, nor hygiene office, police or city of Brno, can’t tell us if we are breaking any law or not. We did countless noise measurements and didn’t broke the limits. On the other hand we understand that it disturbs people living at Opletalova. Therefore we tried to find out the common agreement and possible solutions. We were not allowed to build the shelter for the smokers, that we could afford. Signs, posters and our staff in front of Music Lab did help, but wasn’t enough for the neighbours. We did many concessions (such as shortening our opening hours), but neighbours continue to push against us at the JAMU management, leading us to a dead end and a possibility of closing the Music Lab for good. The main reason being behind this is that the management of HF JAMU is not entirely sure, how big are the benefits that we bring them and to the city of Brno. And here comes your part! We believe that can survive whole situation only if there is enough people, that will stand behind Music Lab. 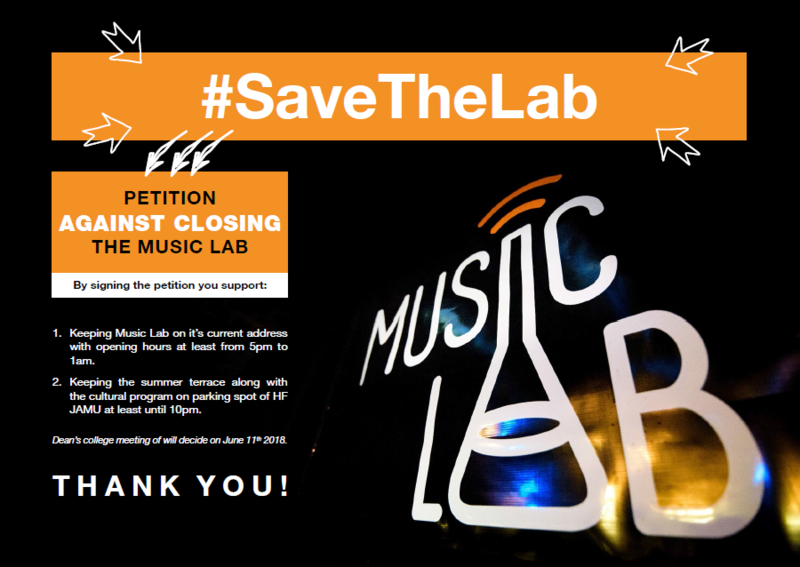 Therefore we would like to ask you for few seconds of your life and signing up our petition against closing of the Music Lab at Opletalova 1. Keeping Music Lab on its current address with opening hours at least from 5pm to 1am. Keeping the summer terrace along with the cultural program on parking spot of HF JAMU at least until 10pm. Our future will be decided on Monday 11.6.2018 on a meeting with the management of HF JAMU. Closure of this petition will therefore be 10.6.2018 and we would be VERY thankful for every single signature, review, referral, share or any kind of help with spreading this to as many people as possible in this short time. If you have any idea how to help us out in our petition, drop us a message on our FB page or to musiclabbrno@gmail.com. Thank you all for all your support. We believe that together we can save Music Lab, so we can bring you many more awesome concerts, theatres, performances, lectures, screenings and other cultural events.